Brow PowerFULL Eyebrow Pencil is rated 3.3 out of 5 by 7. Brow PowerFULL is your best-selling Brow Power Pencil—now with a triangular tip for bold definition and volume! The Universal Taupe shade adjusts to all hair colors—even gray—based on application pressure, while the budge-proof formula adheres to skin for long-lasting results. HYDROGENATED COCO-GLYCERIDES, PARAFFIN, CANDELILLA CERA/CANDELILLA WAX/CIRE DE CANDELILLA, CERA MICROCRISTALLINA/MICROCRYSTALLINE WAX/CIRE MICROCRISTALLINE, COPERNICIA CERIFERA CERA/CARNAUBA WAX/CIRE DE CARNAUBA, OZOKERITE, HYDROGENATED VEGETABLE OIL, CERA ALBA/BEESWAX/CIRE DABEILLE, TOCOPHERYL ACETATE, HYDROGENATED PALM ACID, STEARYL STEARATE, BHT. [+/-: CI 77491, CI 77492, CI 77499/IRON OXIDES]. Following the enclosed guide, use the wider side of the pencil to achieve fullness and volume. Use the pointed tip for shaping. 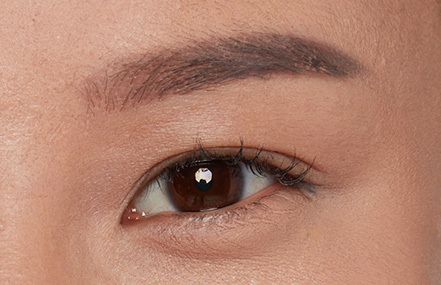 Universal transforming shade adjusts to your brow color. Apply softer strokes for lighter hair colors including blonde and silver. Press harder for darker hair including brown and black. To finish, lightly brush through brows with the spooley brush for a natural, polished look. Rated 5 out of 5 by CJenn from Quick and easy I bought this thru the QVC TSV March and I think it is wonderful. The color is perfect, no red as some other person said. And the miracle is the color intensity adjusts to the pressure you apply. This is one of the best products I have tried for brows. Looks natural and is easy to apply. Rated 5 out of 5 by Blackbella from Easiet brow pencil ever Seriously love how versatile this pencil is!! Love it can be multiple shades based on pressure ! Love the shape of the product that allows me to shape my brows and fill them in!! Rated 5 out of 5 by Hilary83 from Love this! I purchased this as part of the QVC TSV sale in March 2019. I love the original Brow Power, but I feel like Brow PowerFULL is an even better product! It makes doing your eyebrows a quick process, and the color is spot on. I absolutely love what it's doing, and it's now my go to for every single day. I even brought it on vacation! Rated 1 out of 5 by A 77 from Not So Organic I bought this at Sephora and it was sold as Organic which is what I was looking for. Apparently it is not. And also the pencil lead itself slid out of the pencil onto the floor! Besides that it was not the length of the container, so it was deceptive as to the quanity you were paying for. I am returning it! What is the color of the Brow Power Full Eyebrow Pencil?